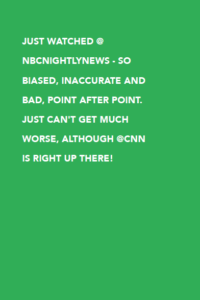 Counterpath – Just watched @NBCNightlyNews – So biased, inaccurate and bad, point after point. Just can’t get much worse, although @CNN is right up there! Just watched @NBCNightlyNews – So biased, inaccurate and bad, point after point. Just can’t get much worse, although @CNN is right up there! is a reading by Amazon Turk workers of a December 11, 2016, @realDonaldTrump tweet. Workers were asked, for $1, to write at least 100 words that explain the surface meaning and subtext of the tweet. The worker identification number is included with each reading. Proceeds donated to nonprofit causes. 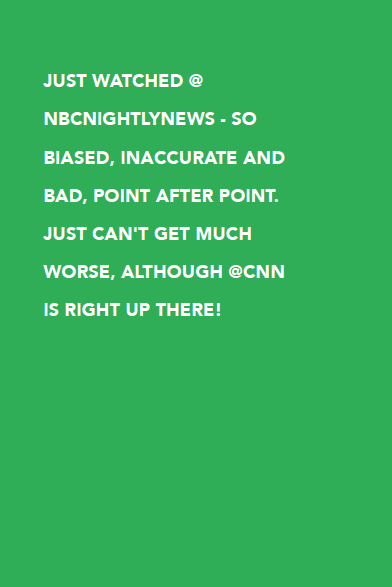 Just watched @NBCNightlyNews – So biased, inaccurate and bad, point after point. Just can’t get much worse, although @CNN is right up there!